It seems fitting during National Non-Fiction November to feature a book that attempts to cover everything. As one would expect from Dorling Kindersley, this is a highly visual non-fiction title, over 300 pages long with an extraordinary number of images. 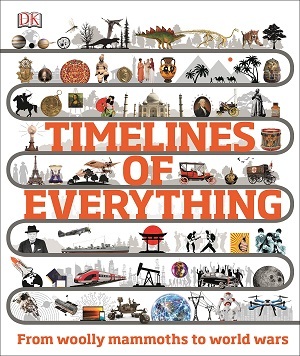 The book explores the history of the world in a series of illustrated timelines on ‘everything’, including slavery in the US, the technology of writing, the industrial revolution, kingdoms of Southeast Asia, postcolonial Africa and much much more. 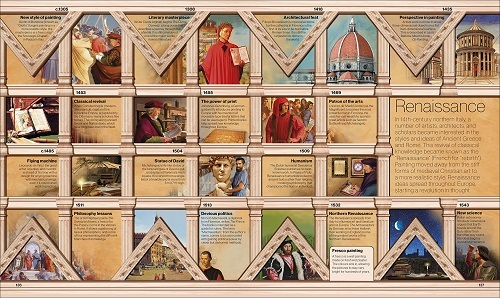 As well as general knowledge, dates, and small explanations of well-known events, there are tiny nuggets of trivia embedded in each page, so that the reader comes away having learnt that the Medieval period lasted from the 5th to the 15th centuries and followed the fall of the Western Roman Empire, and that the majority of the population in Medieval Europe was comprised of peasant farmers, but also lesser-known trivia during the period, including that the Vikings founded Dublin in 841. The timeline on this page traverses neatly between religious re-organisation and acts of battle and aggression, spanning from the East-West Schism in the church in 1054 to the Battle of Hastings, to the Hundred Years’ War, to the to the Gutenberg Bible printing in around 1439. Reading about the Hanseatic League and their trading alliance in 1241 felt relevant to today’s Brexit deals. But it’s not the text information in the book that inspires, so much as the magnificence of the presentation. Each subject is afforded an apt graphic design. The Renaissance is laid out like a fresco between classical pillars. The Timeline of Exploration of the world features dates running up a ship’s mast, Spanish America is encapsulated within a series of silver coins, and Astronomy casts its own constellation across the page. The timelines are also broken up by pages in between – some full colour-paintings including that of the fall of Tenochtitlan, some that document a single day such as the Great Lisbon Earthquake of 1755. The reader can read through in chronological order as set out in the book – traversing prehistory, the dinosaurs and the wheel, before entering the ancient World, Medieval, the Age of Exploration, Revolution and then the Modern World, or simply dip in and out depending on mood and interest. One great fun thing to do is to test fellow family members with the dates of when things happened, flicking through the book at random. The text is accessible, concise, and clear. There are no opinions here, no injected humour, just straightforward precise information. Of course, the whole of human history can’t be condensed into one book, so there are omissions and much is touched on in scant detail, but it provides a context for what’s going on, and a springboard for further discovery. This way, history can be looked at with a wide lens, and then an intrigued child will be able to hone in on what piques their interest and opt for a more specialist look at the subject. To settle arguments and answer quizzes, this is a winner. I liked the roll call of British royalty and American presidents at the end – yes, the book is skewed towards a Western audience for sure – and thoroughly enjoyed the quick romp through choice moments to explore the Story of Democracy. I learned much about the Rise of the Samurai and the horror of Plagues and Epidemics. For a spread-eagled timeline view of the world – this is a wonderful visual treat. You can buy it here.